National Parks | Real Art Is Better! This painting was created in McCarthy, Alaska’s lovely little museum. I enjoyed volunteering at this small museum this summer, and will look forward to spending more days there next summer. 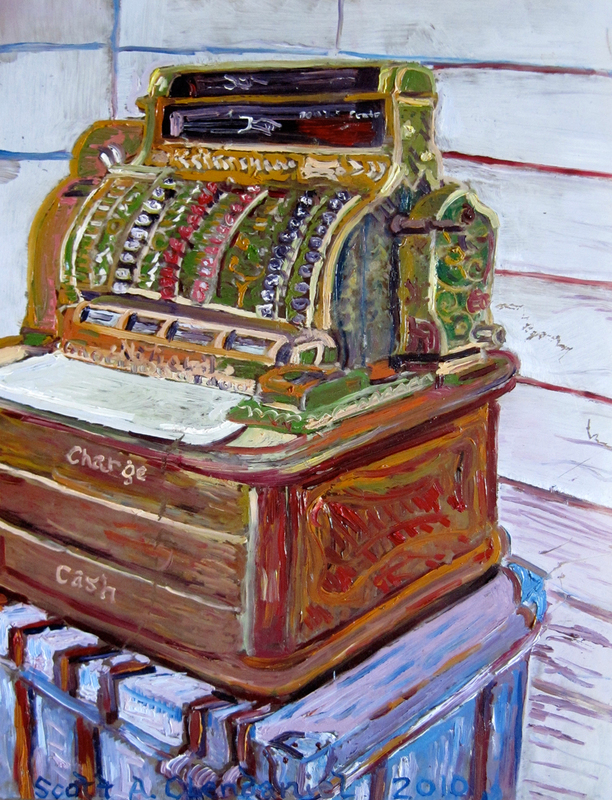 The day I decided to work on this painting of an antique cash register, was full of excitement. Outside on the museum porch are a couple of relics left from the days before the footbridge, two hand-trams that were used to cross over the powerful Kennicott River. Having arrived after the creation of the footbridge I can only imagine how isolating the hand-tram must have been. Well, someone else must have had an active imagination as well, as I was painting away inside the museum, a great commotion occurred at the hand-tram. A large fellow, 300+ lbs, sat down on the hand-tram and flipped it over; he had literally fallen and couldn’t get up! Well, he asked Maria (my wife) to help him out of the contraption, but she obviously couldn’t budge him, I don’t know how she did it but Maria saved the day and the man was okay. However the hand-tram exhibit had taken some wear and tear. It is a good thing that the Museum carries an insurance policy because the hand tram is dangerous. I have smacked my head on it more than once and won’t sit down in it anymore. We need a sign that says sit at your own risk…okay back to the painting. I just love this Art Deco cash register and think about the goods that were purchased nearly a century ago. It really was a long voyage from the steamship to the train, all the way to Kennicott! This unique antique sure would have felt exotic in the Wrangell mountains, just look at that styling. They don’t make stuff like this anymore. 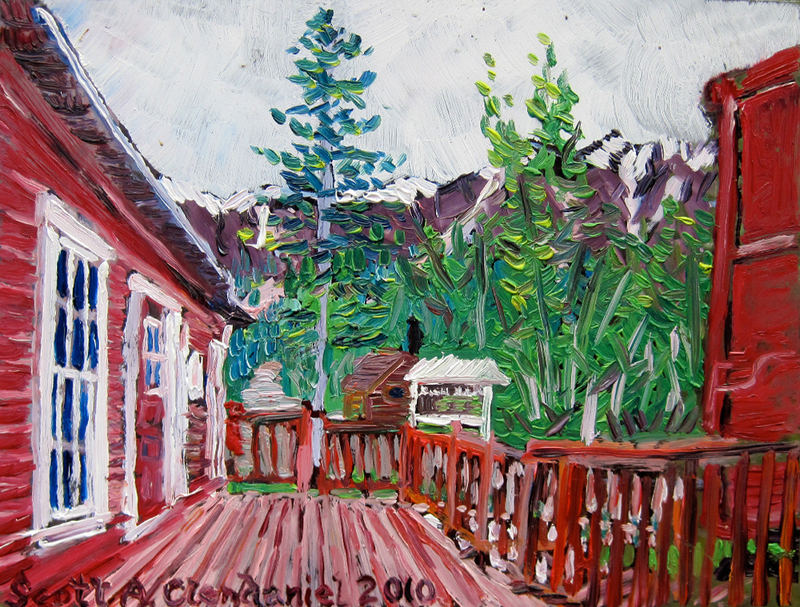 This entry was posted in National Parks and tagged beer painting, mccarthy alaska, pabst beer, pbr, plein air painting, rheinlander, scott clendaniel on September 23, 2010 by realartisbetter. This year my wife and I decided to spend the entire summer in McCarthy, Alaska in the heart of the Wrangell St. Elias National Park! We have a 10 acre lot on the south side of the town of McCarthy. It was fun, but since we had yet to have built a building, I spent almost all my time outside in the fresh air. Since this is a bit different than my usual life, I would jump at any chance to get some time under a roof (especially this summer as we have had so much rain). I decided it would be nice to give back to the community, and get some inside time so I volunteered at the McCarthy Museum. The Museum used to be open to the public without an attendant, however due to recent objects walking off without anyone to observe their departure, the board of directors decided it was imperative that an attendant be present. I stepped up to the plate and volunteered several times this summer. I painted this from the deck between the building and rail-car which houses the collections. McCarthy and Kennecott have such rich histories although these settlements are only around 100 years old, aside from Nome, and Cordova, this is one of the oldest industrialized areas in Alaska. It is extra special due to its rich history and well preserved artifacts. It is especially interesting because the entire town shut down all at once when the Kennecott Mine closed. What was once a bustling mining district became instant ghost towns. The towns of McCarthy and Kennecott became devoid of life except for a few hardy hermits, pirates, and homesteaders. Although the park has almost as many tourists and summer residents now as it had prospectors during the 20’s and 30’s, in the winter months the whole park just about shuts down except for a few hardy souls who winter over the dark and frozen months. I love the McCarthy Museum and I enjoyed making this painting. Later in the season, I gave it away as a birthday present to the notorious B-Mack, at his classic birthday party “The Endless BBQ.” The Endless BBQ is an awesome party held every year, this year with great music by the Grannies and an amazing performance by a lady that goes by the name of Saucy Yoda. 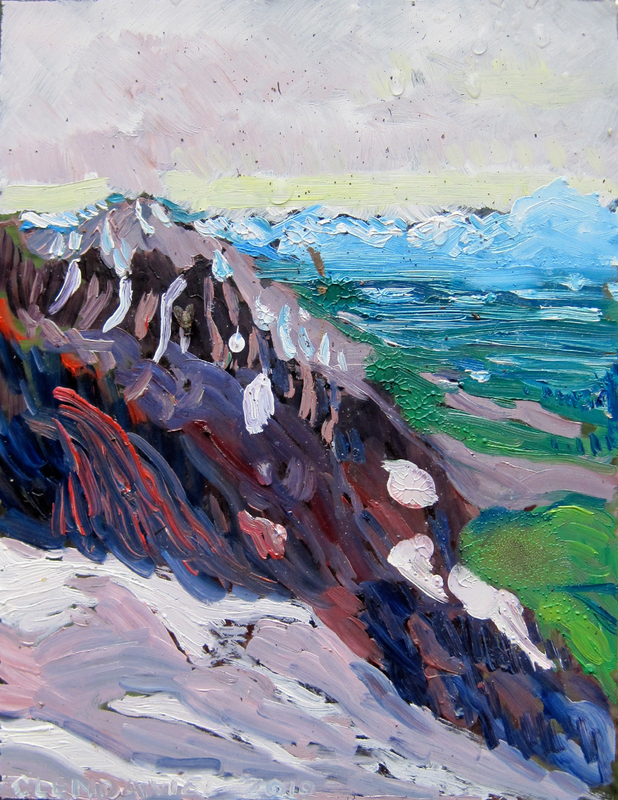 This entry was posted in Alaska Landscapes, National Parks and tagged alaska, kennecott, kennicott, mccarthy alaska, mccarthy museum, plein air painting, scott clendaniel on September 1, 2010 by realartisbetter. Back from the Wrangell St. Elias National Park. I painted some in the park this summer all plein air, as I was in the process of creating my indoor painting studio while I was there. My wife and I had the most amazing summer camping out and building our little hut that will be a painting studio with a little sleeping loft. One of the best experiences we had in the park was when we hiked to the Jumbo Mine. This is the first and only time I have had the opportunity to climb up into this part of the Bonanza Ridge, to the ruins of the Jumbo Mine. Not much left of the buildings and I decided to hike to the top of the ridge. I was a little bit ahead of the others and sped quickly to the highest point under the cliffs on the ridge. 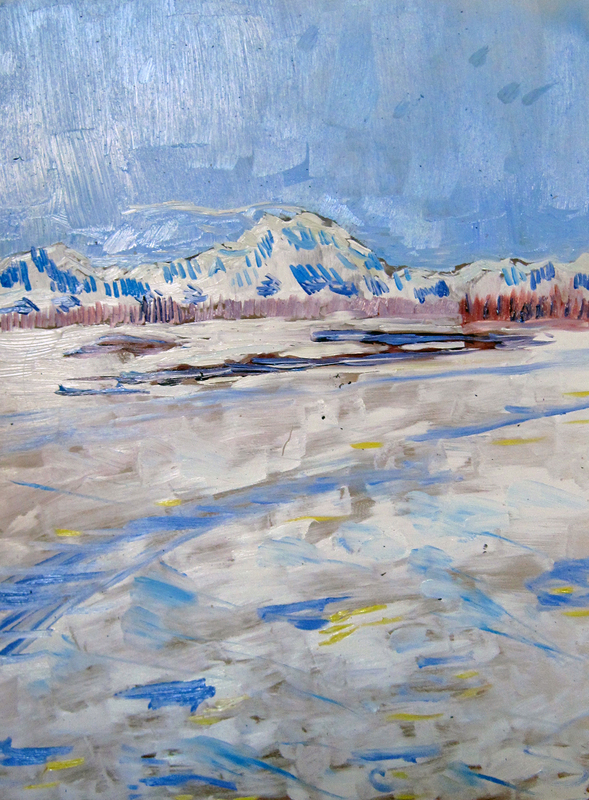 With a few minutes to spare as I was waiting for the crew, I painted this painting looking back towards the Chugach Mountains. While on the ridge, I found lots of green rocks, (Chalcocite with Malachite) a whole vein up on the mountains! It feels so great to be on the top of these amazing bodies of metal. I was glad that I made it down with minimal damage to my painting. Hiking 10+ miles with a plein air kit is not too difficult, but making it successfully home with a wet oil painting is more difficult that most people might imagine, so I always sigh a breath of relief when I get home successfully with a new plein air piece. 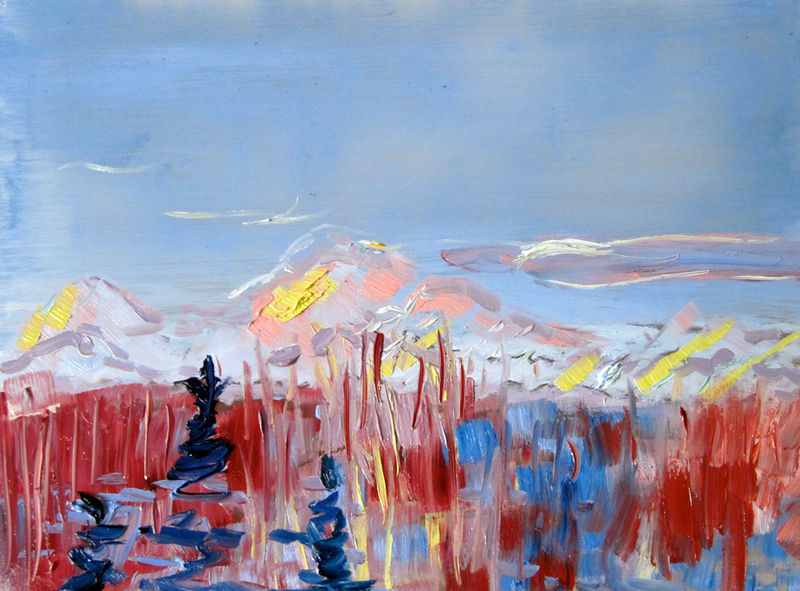 This entry was posted in Alaska Landscapes, National Parks and tagged alaska mountains painting, jumbo mine painting, plein air painting, scott clendaniel on September 1, 2010 by realartisbetter. It was a fun little excursion to Talkeetna yesterday, finally making it out of Anchorage around noon. Stopping to pick up our friend Dani, and for some espresso, we made it to Talkeetna around 3:00 in the afternoon. We, of course, made it to the Denali Brewery and were surprised to find very good craft brew! We took our booty down to the River and sat around a makeshift fire for several hours taking in the view. Here is what came of the painting effort. Too bad I started to run out of white on the third one who would think there would be so much white in Alaskan winter! At least I am finally outside again and painting! 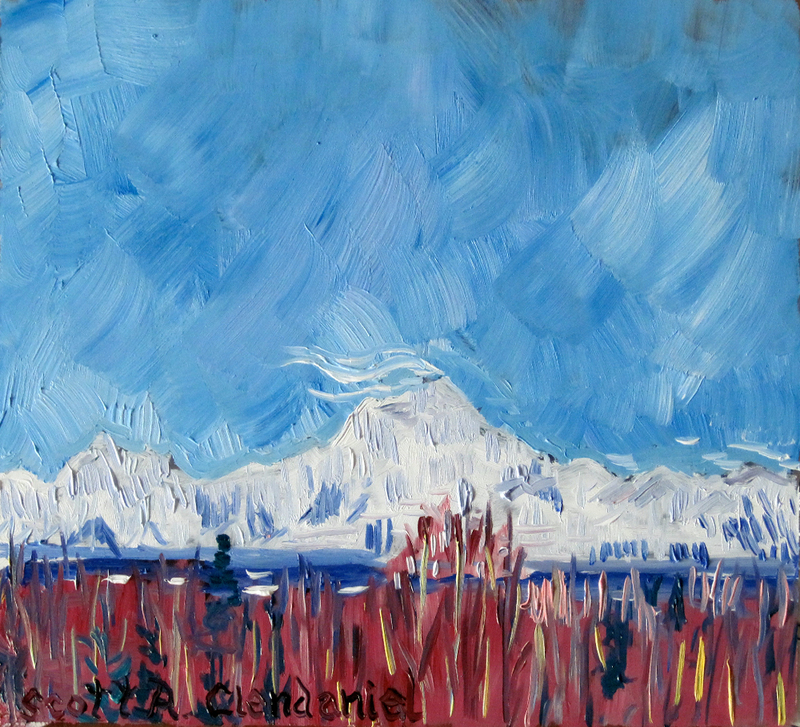 This entry was posted in Alaska Landscapes, National Parks and tagged denali mountain painting, mt mckinley alaska painting, plein air painting, scott clendaniel, talkeetna alaska painting on April 10, 2010 by realartisbetter. Triple M Experience in Wrangell St. Elias with Jared…. On my last trip to McCarthy, Alaska in Wrangell St. Elias National Park I had what I call the tripple M, the most marvelous McCarthy experience. It was amazing! Another Super-friend has been dubbed, and the pursuit of happiness was achieved. I painted this after bringing out three large windows, with a load of stuff for next summer, riding 60 miles within’ the park, climbing to near 7,000 feet, and drinking several liters of homebrew a night! Overall, it was a very successful vacation/building trip in the national park. The last day we rode to the Nizina River and saw the breathtaking Chitistone Valley. After the near 20 mile ride we were pooped sitting around our campfire drinking a treasured bottle of homemade Pinot Noir from the vineyard Jared works at, my old time friend Mark Wacht showed up and reminded us that we said we would attend a party with him. 20 minutes later we were sitting in this tiny cabin on a lot in the Wrangells sipping rose wine from the Willamette Valley, swapping tall tales in McCarthy, Alaska. I painted this painting for Kyle, a new friend out there, as a hospitality present. Kyle, I hope your winter is beautiful out there. This last trip was so remarkable I am considering making new t-shirts stating “I left my heart in McCarthy, Alaska”. 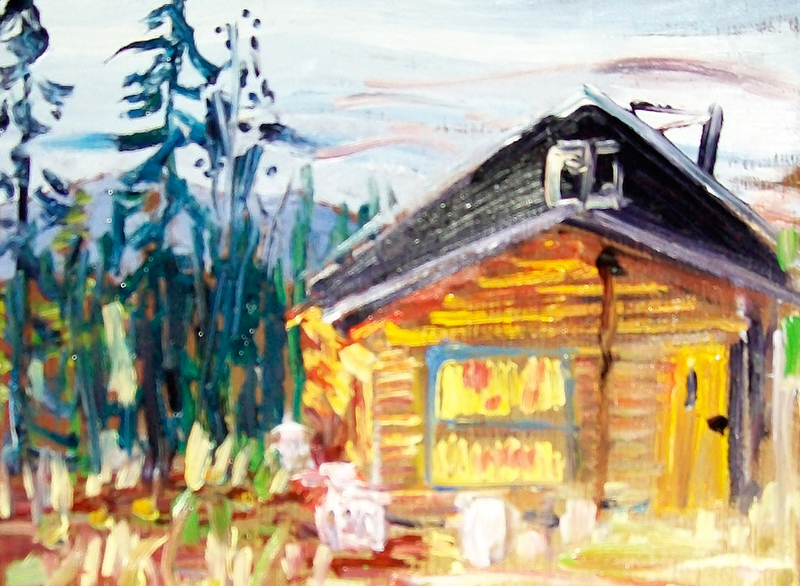 This entry was posted in National Parks and tagged mccarthy alaska, mccarthy cabin on September 8, 2009 by realartisbetter.